That I am alive because I am alive. Breathing in the oxygen from the trees around me and perfectly made for this perfect planet in the middle of eternity. One with all that is because I am. The God that I have come to know and love is intolerant of judgment and hatred. And I know this, because I was raised Roman Catholic in a Latin household and went to private Catholic school my whole life so I have studied WAY more than most of you have studied the religion or the Bible for that matter. You don’t get to deem who God loves. When your “beliefs” allow for the dehumanization and invalidation of a whole COMMUNITY of people’s existence, it is WRONG. Ask Jesus. It seems fitting that this tattoo speaks to the ill-defined nature of God, which is interpreted many ways by many people. The phrase “I am that I am” can also been seen as a statement on self-acceptance. Lauren has dealt with homophobia, sexism and xenophobia but has only become stronger because of it. “I am a bisexual Cuban-American woman and I am so proud of it,” she wrote. 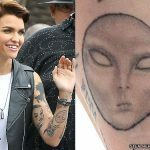 She is no longer afraid to be herself and to speak her mind even though record label executives have warned her that she might alienate fans by doing so. 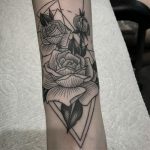 Lauren was accompanied in her tattoo session by a group of her closest friends and family who all got inked along with her. Her brother Chris Jauregui got Spanish writing on his bicep. Their mom Clara got the initials “LCT” on her wrist for her children: Lauren, Chris and Taylor. Longtime friend Erica Timmons got a spine tattoo which says “present in peace” with the same font and placement as Lauren’s. Lauren’s boyfriend Ty Dolla $ign got tattooed but not with anything matching. The rapper, with whom Lauren collaborated on the song “In Your Phone,” got a skull on his thumb. Woah Vicky has an uplifting Christian tattoo on the inside of her right elbow. 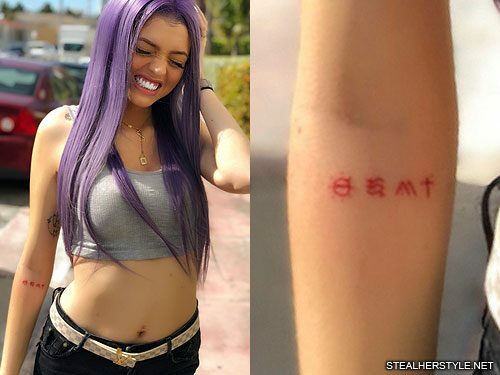 Four minimalist red ink symbols – a sun, waves, mountains, and a cross – represent the lyrics “There is hope, should oceans rise and mountains fall, He’ll never fail” from Hillsong United’s song “Take Heart.” Artist Noel Shiveley designed the symbols which are a popular tattoo. Lucy Hale has two lines of writing tattooed on the right side of her rib cage. They say “catch the foxes for us” which is a verse from the book Song of Solomon 2:15 in the bible. Honestly there are too many memories to count, and I miss them all. I love her. She was just an incredible person. 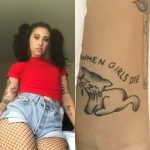 Christina was tragically murdered while signing autographs at a concert in Orlando on June 10, 2016 and Jacquie got her tattoo shortly after. It was first seen in an instagram photo on July 7th. 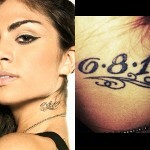 Jacquie isn’t the only person to commemorate Christina’s life with this tattoo. 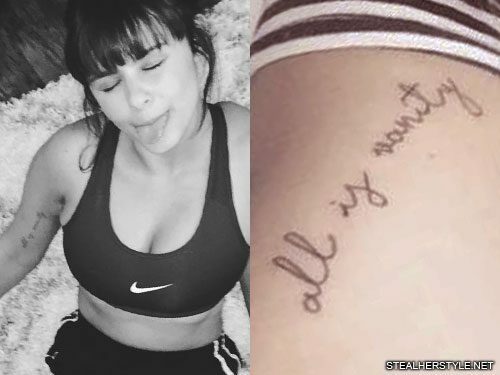 On August 13th, members of Christina’s entourage including her brother Mark Grimmie, producer Stephen Rezza, stylist Audrey Brianne, hair and makeup artist Emily Christison, and publicist Heather Bes all went together to get “all is vanity” tattooed on their forearms. The phrase comes from the bible verse Ecclesiastes 1:2. 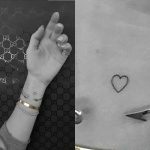 Jon Boy shared a photo on his Instagram of the newest tattoo on Hailey Baldwin’s hands on August 24, 2016. 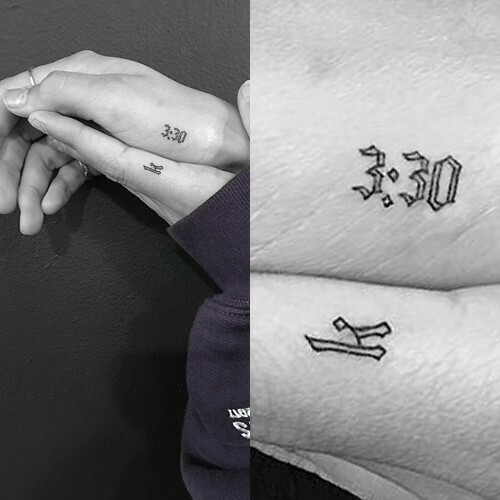 The new ink features The letter “K” on the left index, as well as a 3:30 on the right hand, which according to the caption is in reference to the Biblical passage, John 3:30. 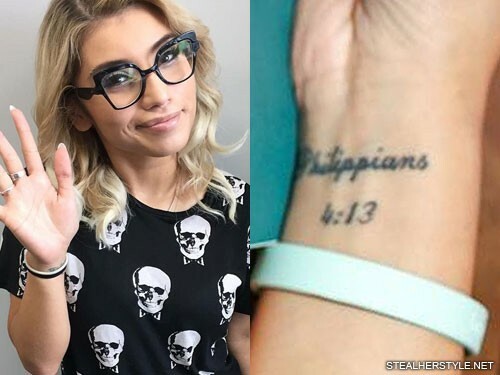 Kirstin Maldonado’s second tattoo was of her favorite Bible verse “Philippians 4:13” on her right wrist. 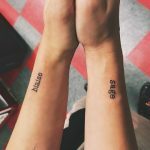 The text of this passage is: “I can do all things through Christ who strengthens me.” This is the same verse that inspired Selena Gomez‘s hip tattoo. 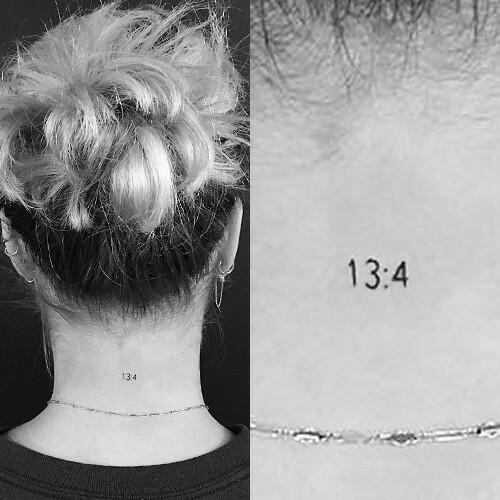 Sofia Richie has another religious themed tattoo on the back of her neck. 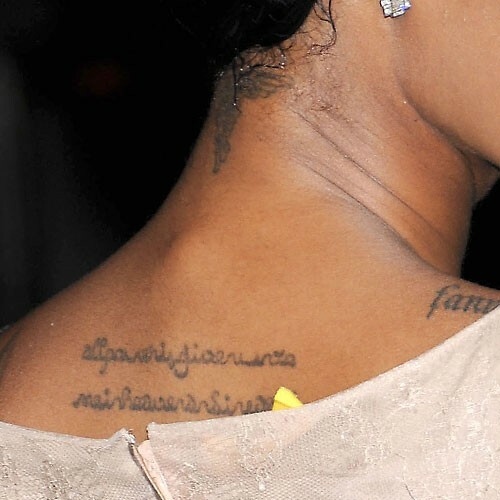 “13:4” refer to a verse from Corinthians that reads “Love is patient, love is kind. It does not envy, it does not boast, it is not proud”. 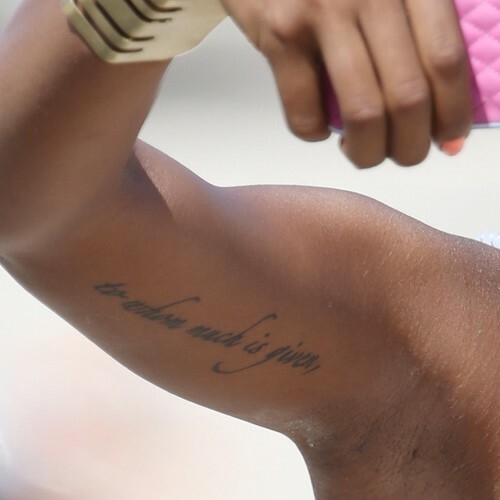 Eva Marcille has the Luke 12:48 Bible verse “to whom much is given” tattooed on her right bicep.